The generosity of those on campus was recently shown as LSUS wrapped up another food drive. The drive has allowed the students and staff members to come together for a great cause. Everyone has been busy the past two months collecting food in the donation bins for the Food Bank of Northwest Louisiana. Most buildings on campus had a food donation bin on each floor so students and staff could always conveniently find a place to donate. While some did not care which bins they put their donations in, some preferred to keep their donations in their academic building to show a little friendly competition. For the second year in a row, Bronson Hall claimed the victory for donating the most pounds of food, and they were rewarded with a trophy and bragging rights. While the campus competition adds a bit of excitement, competition should not be the driving force of the donations. Donating helps those in our community that is less fortunate. It takes just over a pound of food to make a meal. After a donating 3,938 pounds of food last year, the goal amount was set at 4,000 for this year. 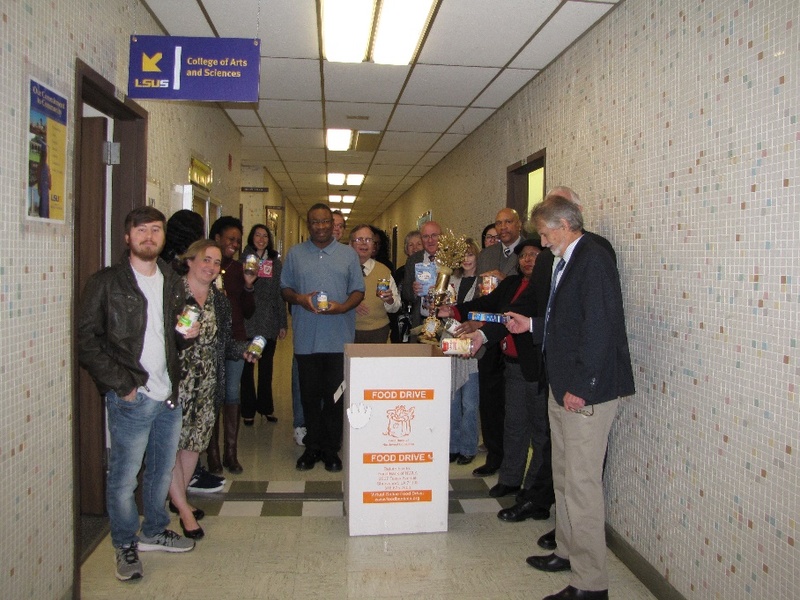 LSUS was able to bring in a grand total of 5,070 pounds of food donations. This will provide over 4,000 meals for those in need. Not all of this food is going directly to the Food Bank of Northwest Louisiana; twenty percent of the donated goods are staying on campus in the brand new LSUS Food Pantry. Food donated by students and staff will benefit, not only people in the community that we do not know but also students on campus that we know personally. LSUS came together to help battle the fight against hunger and greatly surpassed our goal. Next year, let us challenge ourselves once again and donate even more to continue fighting hunger alongside the Food Bank of Northwest Louisiana and the LSUS Food Pantry.